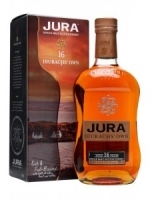 The 16 year-old official bottling, also subtitled ?Diurach?s Own? after the name for the people of Jura, spends 14 years in ex-bourbon, and then is transferred for 2 years into Amaroso Oloroso sherry casks to finish. Nose: Elegant citrus ? grapefruit maybe, or bergamot. Mildly sherried, as befits the finish. If there?s any Island peat present, it?s in the form of a soft, ferny, heathery aroma in the distance. The fruit is fresh and bright, and backed up by a capable maltiness with breakfast cereal and spongecake. Soft, lovely, and floral. Very nice. Finish: The heather notes return, with honey and a bit of oaky tannins. A final wave of very mild citrus ? just pith, maybe ? and a ghost of bitterness.